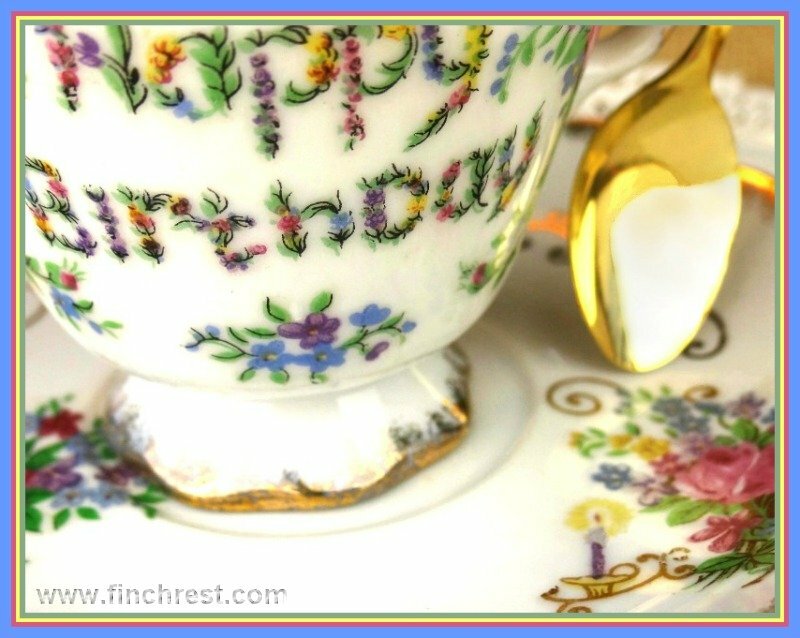 The Nest at Finch Rest: Birthday Tea Cup! I have teased and hinted about sharing my amazing birthday tea party my sweet friend Mary hosted for me almost two weeks ago....and need to get on that soon.......I promise! But I DID want to share her wonderful birthday gift to me! 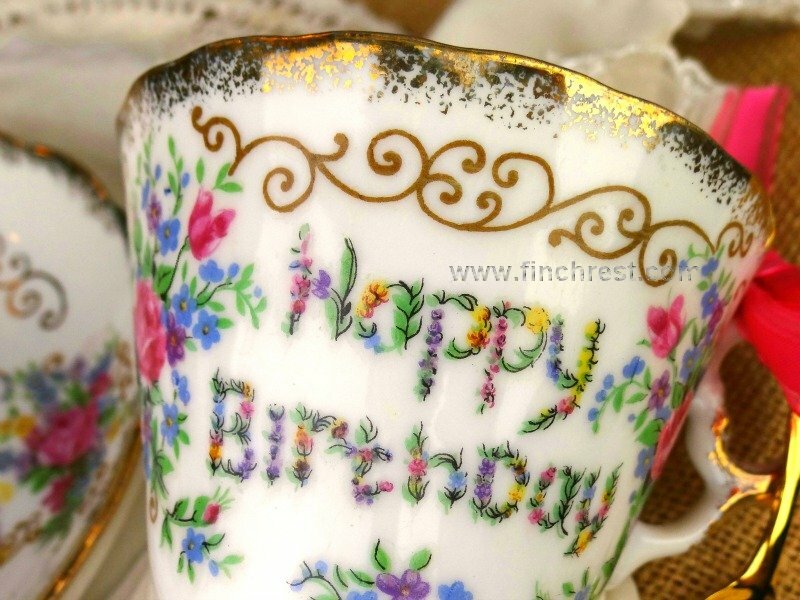 Look at this lovely vintage Japanese birthday tea cup! Isn't it gorgeous and amazingly FESTIVE?!? and wrapped it with these precious lacey vintage gloves. She even put in that sweet pink satin rose! She does everything like that- always full of detail and beauty. I also wanted to share that my baby girl turned 30 today. 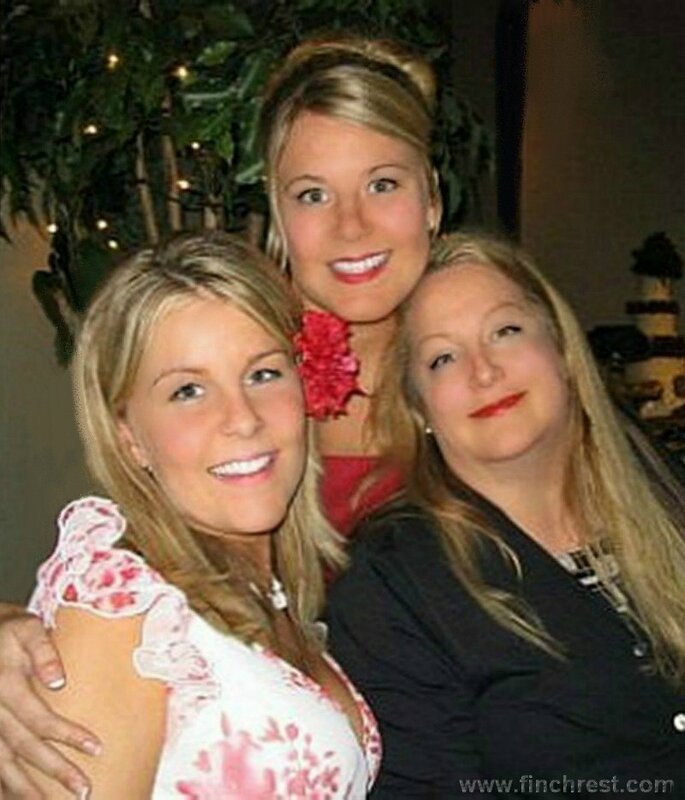 Here is one of my very favorite pics of me with my two beautiful girls. It's a few years old, but still one of our best ever together. That silly dreamy face I am making is simply Mommy Love Bliss. and it was pure joy for me all of us being together that weekend! The birthday girl is on the left. seeing her in a girlie-girl pink dress with ruffles! That is a pretty tea cup, such a sweet gift. Your daughters are really beautiful, like their mama.Happy birthday to your daughter! and thanks for visiting me. Michele, it is indeed a lovely teacup, I love the way Happy Birthday is spelled out with flowers. Happy birthday to your beautiful daughter, you look so much alike it was hard for me to tell which was you, at first look. Your girls are gorgeous, Michele! I see that get a lot of their looks from you. : ) This is the perfect teacup for you! Especially for your birthday. This is really sweet - a real keepsake cup and saucer - thanks for linking to "Friends Sharing Tea".....pretty ladies too! Happy Birthday to you! Happy birthday to each of you! I am waiting patiently to see your tea part! Thanks so sharing your newest cup...it is a beauty! The coloring and gold sponging is gorgeous! You and your daughters are very beautiful! Happy Birthday to each of you! And I LOVE your teacup ... so pretty. Beautiful girls and their beautiful Mother! Lovely Happy Birthday teacup from your friend. Happy Birthday to your baby!!! Michele, your friend was very thoughtful with her gift of teacup, which is unique, the spoon and gloves. The photo looks like 3 sisters, not a mother and daughters...put on that dreamy face again with this fact, you deserve it. I love the details in your birthday gifts! Some people really know how to make a gift even more personal and special by adding their own touch. First let me say that your daughters are gorgeous! What a beautiful picture of the three of you! The birthday teacup is so pretty! What a sweet friend you have. We are loaded with October birthdays around here. Beautiful daughters and I love the "mommy bliss" look. So lovely the three of you. The tea cup is a sweet gift. That's another item that I've never seen before...a specialized tea cup for a birthday celebration. What a sweet picture of the three of you! 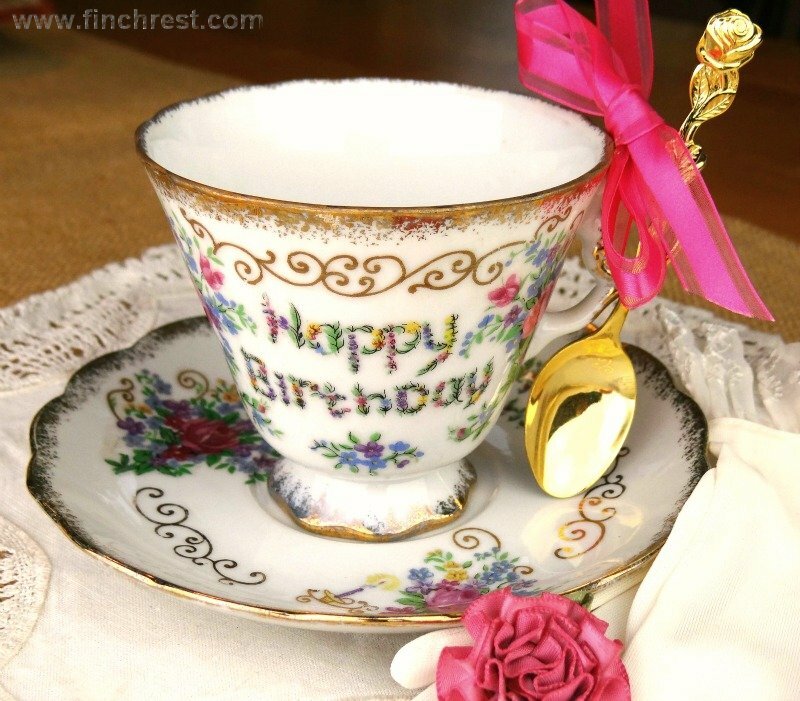 I love your birthday teacup; it's adorable. And Happy Birthday to your daughter too. I have added your name to the draw for my Giveaway even though you didn't want me to. If you knew how many Giveaways I have won in the last four years! Have a lovely rest of the week, my friend. Yes, beautiful girls and beautiful mom. I understand that look on your face. Bliss. I love the cup your friend gave you. I have Never seen anyone like it. It is pure fun and I guess will make it's way out every year. Very sweet friend! Wow my sweet friend, what a lovely post ! What a stunning gift your friend bought for you, I adore it. You can tell that great thought and love was put into it. You are all so pretty! I love that sweet teacup...what a wo derail friend! I love this cup and have never seen anything like it! It looks like a fun time and you enjoyed your day! You have beautiful daughters. Your birthday tea cup reminds me of my anniversary tea cup I have. Very Beautiful. What a pretty teacup. But what's even more beautiful is your family! Your girls are adorable and I can see they get their good looks from you! Happy Birthday to your tomboy dressed in pink! That tea cup is wonderful! I love china with messages. Happy birthday to your daughter, the photo is lovely! I hope you had a fabulous birthday. What a beautiful trio of ladies! BELLISIMO! All 3 so stunning - and that cup is so unique perfect for your birthday!! Oh Michele I love the pic of you and your girls! You are all just dolls!!! Wishing you, your daughter, and sis all very Happy Birthdays. The teacup is so cute. I have never seen anything quite like it. Thanks so much for sharing with Share Your Cup. I like your Birthday Tea Cup. Today I began to follow your blog. A good source for inspiration.